Eagerly looking forward to the big game this afternoon, I went to the fridge and got out the tuna salad that my good wife Jane had made yesterday afternoon. 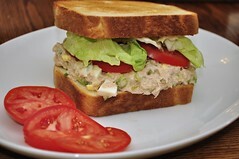 We had gone to the market together to shop for groceries yesterday morning, and I had remarked that “boy, I’m really in the mood to have a nice tuna salad sandwich during the game tomorrow…maybe even with a dill pickle.” So we headed straight for the canned fish section to (duh) get some canned tuna. I, of course, picked out a can of R&P tuna and was about to put it into our cart when she snatched it from my hands and proceeded to look on the shelf for another brand…”Ah, here it is” she said, and handed me a can of Cruz’s 42 Tuna. “Compare these labels” she said and handed me the Cruz 42. So I began to read the label info on both of them – something I admit I usually forget to do (my double bad) – and wow, the R&P brand had more rodent feces than the Cruz’s, which is only, as Cruz’s 42 promises – 42% rodent feces. The Rubio and Paul tuna had 44% rodent feces! I was so glad my Jane pointed this out to me that I grabbed her right in front of everyone in the canned fish aisle and gave her a big smooch. Imagine – 44% rodent feces – when you can get one with only 42% rodent feces on the shelf right next to it. I’m here to tell you that I am a very fortunate man that I have a wife who looks out for my health so vigilantly. Next, I chose the pickles – and this time I was careful to compare the label info – and I’m glad I did because I was informed enough to choose the Christie brand over the RP brand. The Christie pickles only had 32% “liquid of an unknown source yield” as opposed to 36% of the L.O.U.S.Y in the Republican Pride brand. Jane beamed at my choice, and I was feeling pretty smart – if I don’t say so myself. (I wish I had been as satisfied with the game – we lost by 7.) After the game we went for a nice walk, and about 2 blocks from us a neighbor’s house was on fire. There was pandemonium everywhere, and Jane and I rushed to join the bucket and hose brigade. It’s just too bad that it was Sunday, and the Fire Department was closed. Now that they, and everything else, have been privatized due to the passage of the “American’s Taking Responsibility for Everything” bill that President Perry passed with the help of the Republican Congress, the Fire Department is now only open Monday to Friday from 9am to 5pm. We fought the fire as hard as we could but the house burned to the ground. Last we heard, the insurance company, E-COMIC, Eric Cantor Omaha Mutual Insurance Company, says the home owners started the fire on purpose (?) and E-COMIC won’t honor the policy – bummer. Cantor – Omaha also cites one of the provisions of the “American’s Taking Responsibility for Everything” bill, “The Each American Taking Complete Responsibility Always Permanently” provision or: E.A.T.C.R.A.P. which merits Jane and I discussed, and we both came to a consensus that if President Perry, and Vice-President Rubio thought it was a good idea then who were we to argue? Anyway, we’ve all taken up a collection to re-build the neighbor’s house, and so far we have $825. 38. Jane and I have high hopes.